Dice have become synonymous with role-playing games, from appearing in logos to references in podcast names to the titles of books. As the first tabletop RPG, D&D, used polyhedral dice, it’s understandable why dice would become a standard for random numbers and determining outcomes. RPGs aren’t limited, however, to the whims of small plastic shapes as they dictate the will of RNGesus. After the first couple of decades, as the industry grew and new designers tried unique approaches, games appeared that shrugged the tradition of dice. The “diceless RPG” genre started in the 1990s, and it’s only grown since then, producing some great games. Some use other forms of random number generation while others compare static numbers; you’ll even find those that forgo both in the name of back-and-forth (or round-table) storytelling. We love games of all shapes and sizes, but sometimes it’s nice to put the dice down and try something new. This Tabletop Tuesday we’d like to talk about those that break with tradition and go completely diceless! The simplest way to go “diceless” is to use something other than dice to produce random numbers. Frankenstein Atomic Frontier is a post-apocalyptic game using a regular deck to generate characters and action resolution. Players determine character attributes (each tied to a suit) based on random draws, and then draw cards based on those rates (plus equipment); any face-cards or Aces drawn count toward success! The second edition of Primetime Adventures uses a standard deck as well, although successes are based on red cards drawn (rather than face-cards). More story-based, PA is a cooperative, narrative game where players create a television show and portray the main characters. Clockwork: Dominion is a steampunk game that uses a specialized deck of cards; the deck (with values that range from -5 to +5) is used in both character creation and during the game. When performing actions, players draw a card, add any relevant modifiers (like skills), and then determine success based on a target number. Freemarket also uses a specialized deck of cards, one for each player as well as a shared group deck. This Transhumanist game set in the far future also uses resource pools to initiate a resolution, but the cards determine the outcome. Mystic Empyrean is a fantasy game of god-like Eidolons with a deck of elements and energies; successes and failures can run a range depending on the action and how close the card is to the target element based on an element wheel. ME also has a unique attribute system (which determines cards drawn/re-drawn), as the other players determine how your traits develop based on your behavior each session. Fate of the Norns: Ragnarok is a new edition of the 1993 Viking-era game that replaced dice with the Runic Game System. Players draw several runes from a bag (based on their traits) and then use them to take (or succeed) at actions. FotN:R also has different complication levels for interpreting and applying the runes, allowing for unique, advanced gameplay. Other games forgo a lot of randomness, allowing players to accumulate and spend various resource pools to accomplish successes. Active Exploits is a generic set of rules intended to be used with any type of game. Players spend ability points (added to skill ratings) to reach a target number; abilities return to their starting values each scene, so players must think carefully about their actions in that situation. Golden Sky Stories is a (usually) non-combat, family-friendly, anime game where players portray henge, an animal in human form. Characters earn different types of tokens, which they can then use to expand relationships (Dream), activate abilities in-game (Wonder), or resolve action checks (Feelings); tokens refresh each scene depending on relationships with others. The Marvel Universe Roleplaying Game published by Marvel in 2003 used a simple pool of red stones to determine how much effort or energy each character had. Players bid points to resolve situations or in combat (allocating them to attack, defense, or powers); pools were capped and regenerated each turn based on traits or powers. Mortal Coil is a supernatural fantasy game, with cooperative world-building, that uses complex bidding to resolve actions or conflict. Players dictate scenes and their actions, can allocate, spend, or sacrifice resources to different traits, and then compare the final numbers to determine the total outcome of everything. Theatrix is a cooperative game of movie storytelling, where Actors follow a script with their Director; the use of Plot Points grants control over a pre-dictated outline. Although this game has traits, both numerical and descriptive, a resolution is primarily solved through flowcharts and Director fiat. Whereas resource pools still have a modicum of randomness, particularly if bidding is required, some systems instead compare traits to determine the winner. The earliest diceless RPG was 1991’s Amber Diceless RPG, based on Zelazney’s Chronicles of Amber series and portraying the godlike children of the main characters. Although it used bidding to determine initial traits and ranks, a resolution is primarily solved through role-playing while a conflict is a straight comparison of who has the higher rank; the best way for a lower-ranked individual to win is to swing the battle into a trait in which they have a higher level. Many diceless games used Amber as a basis for their own rules, including Lords of Gossamer and Shadow (with a similar premise of godlike beings in a multiverse). The designers refined the game a little bit, but overall it was heavily drawn from Amber’s trait comparison mechanics. Nobilis is possibly one of the most famous (and challenging) diceless systems, and one of this author’s favorites. Portraying gods with ultimate rule over specific domains (and superhuman abilities), it uses trait comparison to determine the winner of any conflict. The second edition of Sufficiently Advanced, another far-future Transhumanist game, uses trait comparison to determine success; Capabilities and Expertise are compared to the number required to perform an action of that level/difficulty (with the use of Reserve to make up any difference). SA, however, has a complicated conflict system that also uses a Strategy deck and Tech chits to resolve specific goals against opponents. Many games care little about RNG, resource pools, or even trait comparison. Story-games, which often use a round-table, cooperative manner to create their tales, usually forgo dice (or any tools). Dread and Star-Crossed Lovers both create a bit of randomization using a Jenga (or similar) tower. Actions require players to pull a block, with a significant consequence should the tower fall; in the horror-themed Dread, the character is removed from the game, while the romance-drama of SCL ends on a down-note of unrequited love. Chuubo’s Marvelous Wish-Granting Engine is semi-generic, inspired by Japanese fantasy like Studio Ghibli, and uses a cooperative world-building approach. Players earn XP through achieving goals and even affecting others emotionally; the game is primarily narrative, with some conflict resolved through bidding from a Will pool. Everway dictates the story through inspirational ideas and GM fiat, as they figure out success based on characters (Karma) and what makes the best story (Drama). The mechanics also include a touch of card RNG using a Tarot-like “Fortune deck,” with the results far more subjective in how they’re interpreted and applied. Montsegur 1244 is based on the historical events of the Siege of Montségur, where players portray the inhabitants of that castle and their inevitable fates. Using cue cards, each character will narrate their scenes throughout several acts, using various plot twists to add drama. Universalis is a generic game where players determine a setting (and its tenets) and then describe scenes and the facts within. Players bid coins to start new scenes and to dictate the Facts within them; when players disagree, they resolve the conflict through bidding with the winner narrating the result. A Penny for My Thoughts is a dark game of amnesiac trauma victims trying to remember what led to their presence in a group counseling session. Random words are written down and drawn, providing hooks, while players lead each other’s storytelling through questions. The games we’ve talked about are just some of our favorites in the “diceless” category. Whether you prefer some form of randomness (like playing cards) or want to delve into round-table storytelling, there are plenty of exciting RPGs that require no dice. 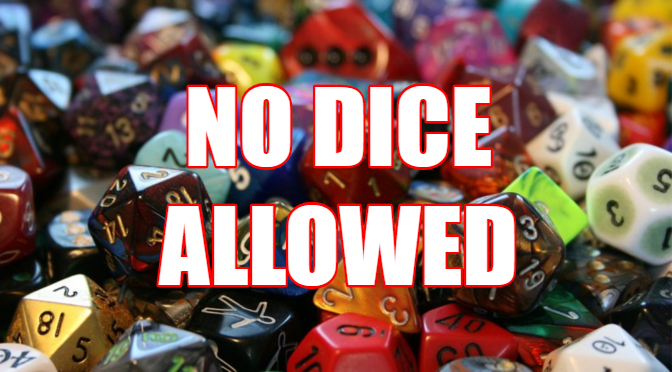 Remember, there is no right or wrong way to play RPGs; if you prefer dice, that’s great! We merely recommend trying some of these out as you never know what you might enjoy. 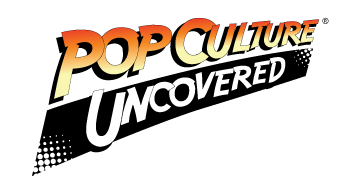 Also, if we’ve missed one of your favorites, please say something in the comments below! That is a really comprehensive list of the best of the best! My cousin and I published a diceless RPG on DriveThruRPG last year called DeScriptors: Definitive Edition, and it’s been a wonderful success. The Worldbuilder’s Anvil podcast has used it as a means to sort of “litmus test” the setting of a novel they were working on. Feel free to check it out!